Hunting and deforestation have reduced tiger populations from hundreds of thousands to fewer than 2500, with three out of eight subspecies becoming extinct during the 20th century. 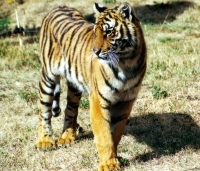 All five remaining tiger subspecies are endangered. The largest member of the cat family known for their power and strength they are often hunted as trophies and their body parts sold for use in traditional Chinese medicine. Bengal Tigers, the most common, live in India. Loners in the wild, Bengal Tigers are nocturnal hunters living off buffalo, deer, wild pigs, and other large mammals. Females give birth to litters of two to six cubs which they raise with little or no help from the male. Cubs cannot hunt until about 18 months old so they live with their mothers until that time when they disperse and find their own territory. Did you know? A tiger's roar can be heard as far as two miles (three kilometers) away. 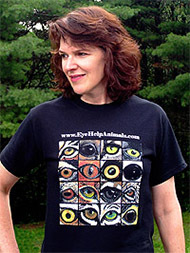 Buy an Eye and help save the Bengal Tiger.